Many farmers in the developing sector have realised today that legumes, such as soybean, groundnut, dry beans and cowpea, can make a significant contribution to excel their cropping system. Legumes can improve soil fertility by their special ability to fix atmospheric nitrogen in the soil. Nitrogen forms a major component of chlorophyll, which is crucial in the process of photosynthesis. In this process, sunlight is used to form sugars e.g. glucose. Sugars are vital to the growth and development of the plant. Nitrogen also forms a major component of amino acids, which are the building blocks of proteins. No plant can exist without proteins. Fixing of atmospheric nitrogen reduces the need for chemical fertiliser with significant input cost savings to the farmer. In rotation, these crops contribute to the reduction of losses caused by pests and diseases. Where groundnuts are, for example, rotated with maize infested with Diplodia, inoculum, levels of the pathogen will decrease over time, because the pathogen can only infect maize. Inoculum are the infective structures of a disease that survive in plant residue and soil. These structures are capable to cause disease in the following crop. The rotation with groundnut (which is a non-host) results in the pathogen not having a viable host to infect and propagate on, resulting in the eventual decline in inoculum levels. The non-host accordingly, provides unfavourable conditions for the pathogen. 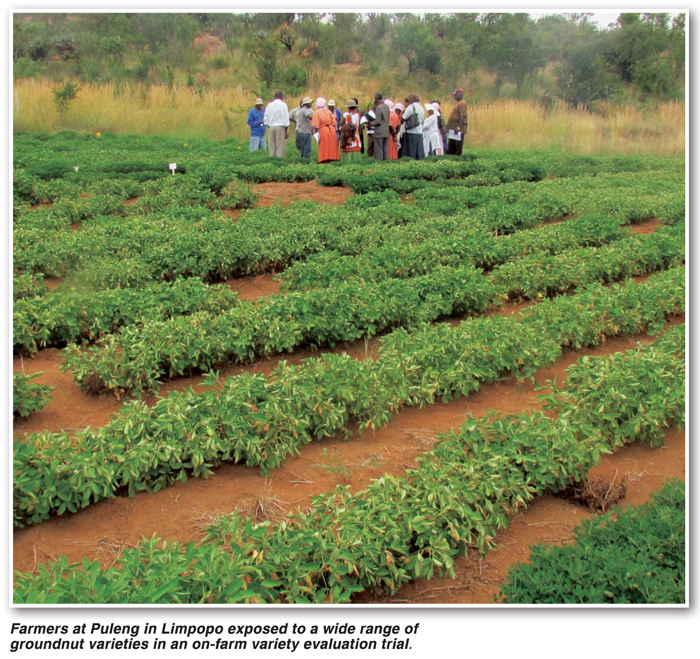 Legumes can increase income opportunities. Good quality red speckled sugar beans, for example, can obtain commodity prices as high as R12 000/ton and even more. Local demand for this commodity currently exceeds local supply abilities. 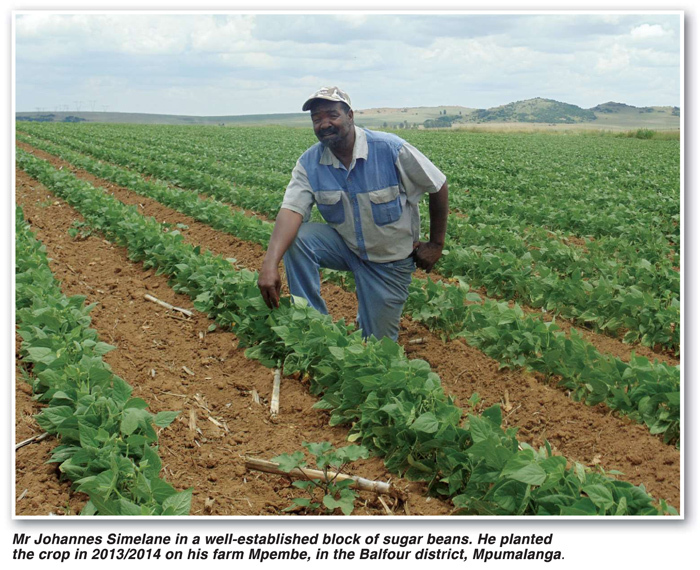 The average of dry beans produced in South Africa over the previous five production seasons stands on 59 500 ton. Compared to local consumption, the demand is 137 712 ton, which represents a deficit of 78 212 ton of dry beans. Large quantities of dry beans are therefore imported each year, mainly from China. This trend creates an opportunity for expansion and, especially for developing farmers located in suitable production areas, to enter the market. The deficit in local production creates an opportunity for expansion and, especially for developing farmers located in suitable dry bean production areas, to enter the market. In a production environment known for its high risks, legumes also provide an opportunity to diversification. Planting a wider variety of crops implies the spread of the farmers risk on inputs, yield and income in a country known for its erratic farming conditions. Crops like cowpea for example is adapted to tough farming conditions, able to produce food even under harsh climatic conditions. The high nutritional value of legumes is well known (Table 1). These crops are an excellent source of protein and fibre. In addition, legumes are an inexpensive source of protein, vitamins and minerals and often it is even regarded as a perfect substitute for meat. 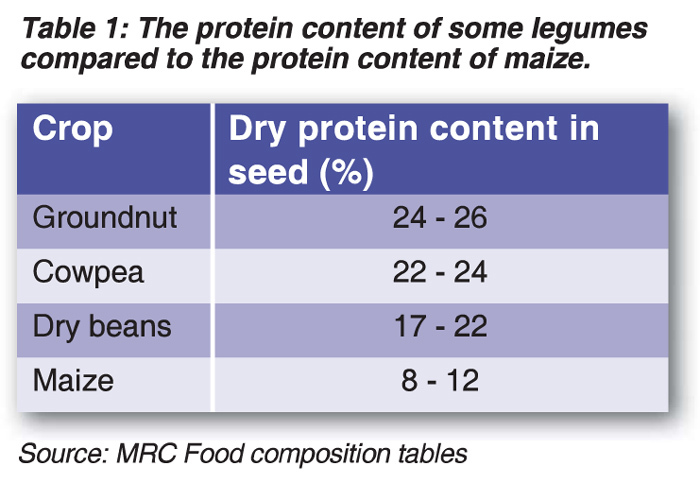 Table 1 gives a clear indication of the protein contents of certain crops in comparison to maize. Although local soybean, dry bean, groundnut and cowpea are widely adapted, they show preferences to specific soil and climatic conditions and will do better on deep and well-drained soils. For instance, dry beans will not perform in Limpopo because of the high temperatures that are prevalent during the summer season (mid-November to mid-March), while groundnut will not perform optimally in Ermelo, Mpumalanga because the temperatures are too low, the daylight lengths too short and the humidity too high. 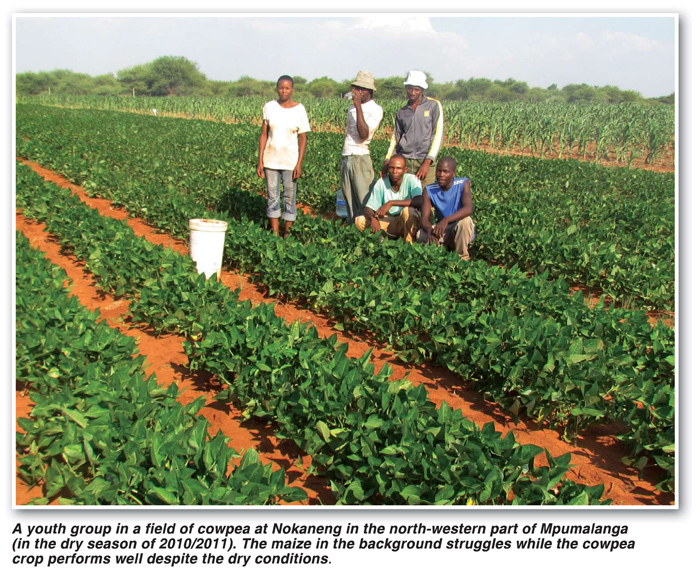 Note that dry beans are successfully grown in Limpopo, however, only under irrigation during winter months in the frost-free areas. Table 2 provides an exposition of soybean, groundnut and dry bean, indicating the production conditions in which these crops will perform best. Within each legume crop, however, a wide range of varieties (cultivars) exist. Each cultivar has its own, specific characteristics that makes it better adapted and more suitable for specific production areas ARC-Grain Crops runs a comprehensive programme to evaluate cultivars for their adaptability and various characteristics in the respective production areas. During the evaluation process, cultivars that obtain the best yield and quality for a specific locality within a specific geographical area, are identified. This information, published annually, in the form of a leaflet (cultivar recommendations) can be obtained, free of charge, from Private Bag X1251, Potchefstroom, 2521, (Tel: 018 299 6100). Table 3 provides the plant population, seed spacing within the row, quantity or amount of seed per hectare recommended and seed costs for soybean, groundnut, drybean and cowpea. For some legumes, e.g. the seed of dry beans has become a very expensive input component. In view of the high seed costs, planning of the planting process and the specific amount of seed is, therefore, a crucial activity in the establishment of legumes (In the case of dry beans, seed cost alone entails 38% of input costs. See Table 5). Furthermore, apart from proper spacing, planting depth (between 20 mm and 50 mm deep depending on soil moisture and clay content) is also important to ensure simultaneous germination. Unfortunately, in-adequate mechanisation systems currently deployed in the developing sector of South Africa presents a significant challenge. A lack of good planters, which can be adjusted to plant the crop at the required plant density and depth, is a factor that makes it difficult for some farmers to adhere to plant populations as recommended. As indicated earlier, legumes have the ability to fix their own nitrogen (N), which reduces the need for chemical fertiliser. They have the unique ability to, in symbioses with Rhizobium bacteria, fix atmospheric nitrogen to make it available to follow-up crops. These characteristics make legumes ideal crops to be included in crop rotation systems. Before planting, legumes should be inoculated by means of a seed treatment. Note: Inoculants are prepacked sachets containing beneficial microorganisms preserved in a carrier to apply as a seed treatment. The value of inoculation is that the inoculant enables the crop to, effectively, fix nitrogen at a low cost. As indicated in Table 4, inoculants should be selected for the specific crop only. In the case of soybean, no proper inoculation will surely result in low N levels available to the plant, which will result in poor yields, unless inorganic nitrogen fertiliser is applied, at high cost. Inoculants should be selected for and applied to the specific crop only as indicated in the table. In the case of cowpea, the rhizobium organism responsible for N fixation occurs naturally in South African soils. In view of this, the economic advantages of the inoculation of cowpea is still in question. Commercial producers of dry beans usually do not inoculate their seed and in most cases, they stick to official fertiliser recommendations (see Table 5). As an alternative, some dry bean farmers, however, do use Rhizobium leguminosarum (Table 4) with good results. The economic value of inoculation and N fixation in the production of dry beans should, however, be researched further. All South African soils are inherently low in phosphorus (P), which can only be built up with extended commercial crop cultivation. Although legumes respond well on residual P, levels of the soil in which it is produced, should be at least 25 mg/kg (Bray 1). At P levels of 15 mg/kg or lower, a purposeful P build-up programme should be implemented, to improve soils prepared for legume production. Soybeans are able to utilise potassium (K) reserves in the soil well. In general, however, legumes are likely to show deficiencies of K in soils with less than 60 mg/kg K. Hence, legumes planted in soils with low K levels will react well on K fertilisation. In the case of groundnut for example, calcium (Ca) is an important macronutrient for kernel development and yield performance. In order to provide sufficient Ca, the uptake of Ca also takes place directly through the pods. When a soil sample indicates that the Ca is low, in a case were liming to rectify acidification is not required, then, calcium in the form of a surface application of gypsum (200 kg/ha - 300 kg/ha) can make a significant contribution to increase the yield of groundnuts. Table 5 illustrates an example of variable costs incurred by dry bean farmers. The total variable cost of R8 330/ha highlights the demand for sound management of the crop, which will also be applicable to legumes such as soybean and groundnut. Table 6 indicates the national average yields and income earned by maize, soybean, groundnut and dry bean farmers during 2013/2014 to 2015/2016. Yield of legumes compared to the yield obtained from maize is relatively low (Table 6). However, prices earned for these commodities compared to the price of maize compensate for their lower yield. 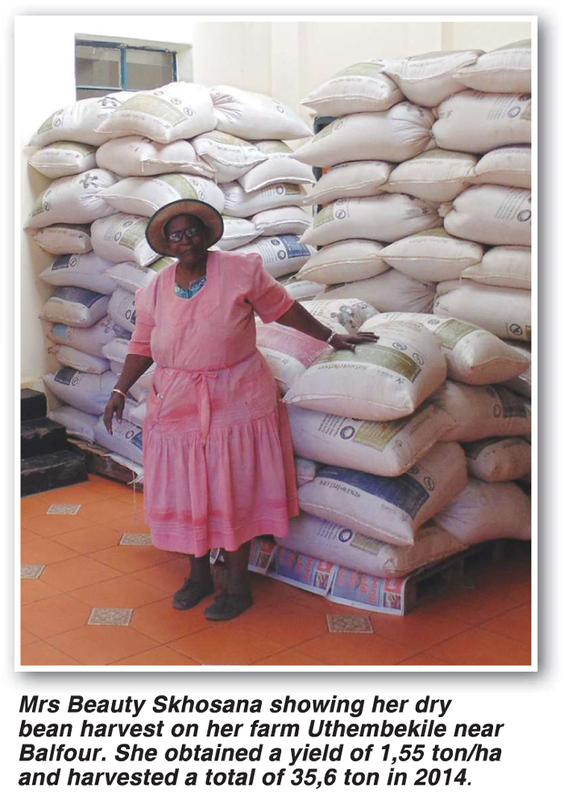 A further decrease in the price of maize during October 2017 (R1 871/ton – Safex), presents the production of legumes as a viable alternative to exploit. The introduction of legumes into an existing cropping system also provides an opportunity to diversify the cropping system and to bring down the risks in terms of inputs, yield and income. For instance, with good management of a dry bean crop (sugar bean), a yield of one and a half (1,5) t/ha can be achieved. Let us assume an income of at least R12 000 per ton can be generated. Since the direct variable cost is R8 330 (Table 5), the profit margin of this crop can be 1,5 t/ha x R12 000 = R18 000 - R8 330 = R9 670/ha. In view of this favourable earning, opting for an alternative such as dry beans implies a meaningful income opportunity, particularly in a time of low maize prices. The introduction of legumes into an existing cropping system also provides an opportunity to diversify the cropping system and in so doing, brings down the risks in terms of inputs, yield and income. Article submitted by APN du Toit, ARC-Grain Crops, Potchefstroom. For more information, send an email to dutoitp@arc.agric.za.